The word intentional has been on my heart for a while now. Intentional. Done on purpose, deliberative, intended, purposively, willfully, meant, preconceived, consciously planned. I feel like so much of my 2014 life was responding reactively. Shoot, it’s her birthday? Thanks Facebook for the reminder – Happy birthday friend! *send*. Wait, I haven’t seen this friend for 8 weeks? How did that happen? I spent too much time doing things on the fly – grabbing groceries on the way home from work, throwing in a quick load of laundry at 9 pm so we had underwear and socks for the morning, sneaking in a call to a friend when it became convenient and not because it was needed. Quiet time happened because this worksheet is due on Thursday or because I had a few hours off and it was easy. The problem is life felt messy and I felt unsatisfied with how many things that were once important to me kept slipping through my fingers. So January 1, 2015 hit and I was armed with my word. I woke up early, spent time in the Word, journaling and praying and reading. Today was the day I would become a whole new person of intentionality. In fact, before Josh even woke up, I had the list made of all the productive things we were going to do to intentionally get in a good place for the week. Taking down Christmas decorations, meal planning, grocery shopping, card writing, a few organizational projects. What a great day it would be! I AM A PERSON OF INTENTION! Well, little did I know that other plans would be made. We were soon caught in a text chain where Josh quickly committed to a much more relaxing day with my parents. Wait, huh? BUT WE ARE GOING TO BE INTENTIONAL AND PRODUCTIVE! I felt so grumpy. My first day of being more intentional was NOT supposed to be learning how to be intentionally flexible. I may have been a crab for an hour as I grieved my day. Thankfully I was still able to get a lot done in the evening but it was a great lesson that things don’t always go the way I have planned. It made me want to change my word. There is a balance to intentionality and I hope to learn that this year. I long to be more deliberative in my commitments and relationships and obedient in the ways He has called me. Life goes by too fast and I want my moments to have meaning. I want the people that I care about to know that I care about them. I want to build up my relationships instead of just maintaining them. I want to put my best foot forward in having a clearer mind and soul. I don’t want to slip into routine, I want to be intentional. Do share, what’s your word of the year? Do you have something you are working on developing or something you are focusing on for 2015? I would love to hear it! Or do you maybe need some ideas? One Word 365 has some great ideas to inspire you! It’s definitely not too late to pick one and run with it! One thing I LOVE is encouragement – seeing others encourage one another makes my heart pitter patter and brings a smile to God’s face! I wanted to be intentional about encouraging others so today on Instagram I am hosting a giveaway based solely on encouragement! Hop over to my Instagram page (@chels819) to leave an encouraging word for a friend. 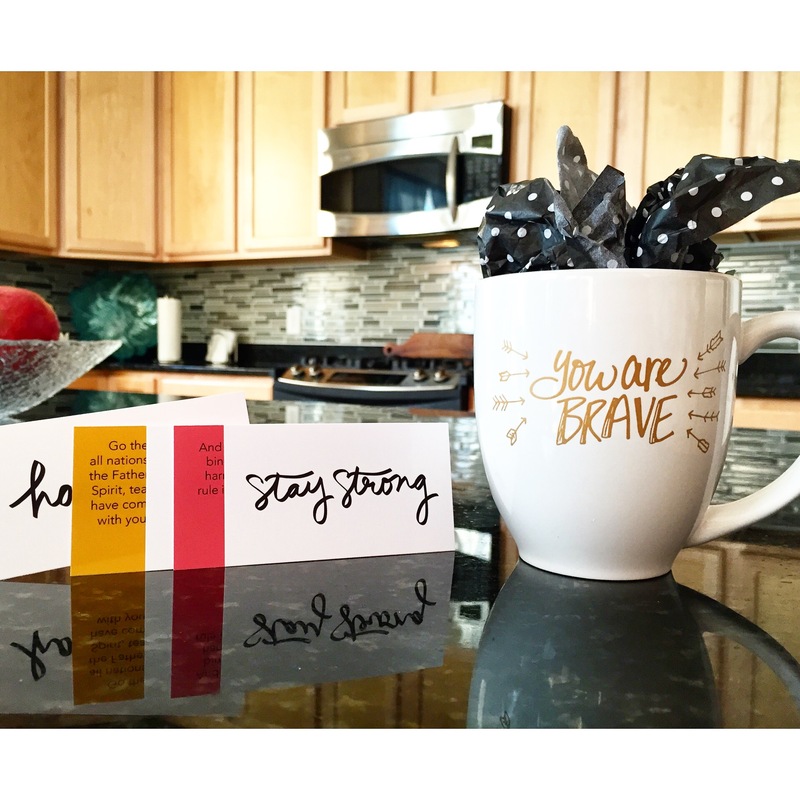 Each message you send to someone will enter you in a giveaway to win this You are brave mug for yourself and the person you tag has the chance to win a set of scripture cards! (USA shipping only). The giveaway is open until 8pm CST Wednesday 1/14. (Both products are sold online at Holly Joy Holt’s website). Join me in being intentional to encourage someone today! Gratitude. Mine is always gratitude. To be glad in it. Love it, love it. Thanks for sharing N.
Very inspirational and a great reminder! I need to be more intentional too. Thank you for the encouragement! My word is intentional too! Am so glad that I found your blog – it’s gorgeous! I pray that you will be blessed and that your prayer of a little bundle of yours! !